Preheat the oven to 450 degrees F. Line a baking sheet with parchment paper or aluminum foil. Combine the pork and turkey by hand in a large bowl. Stir together the oats, 2 tablespoons of the salt free ketchup, 1/2 tablespoon of the mustard, the reduced sodium soy sauce, oregano, egg whites, onions, 1/2 teaspoon salt and 1 teaspoon pepper in a small bowl until combined. Add the oat mixture to the meat mixture and combine by hand. Form the meatloaf mixture into 4 small football-shaped loaves, about 4 inches long and 1 1/2 inches thick, and place on the prepared pan. Stir together the remaining 2 tablespoons ketchup and 1/2 tablespoon mustard in a small bowl. Brush some of the ketchup mixture on each meatloaf. Bake until fully cooked, about 20 minutes. 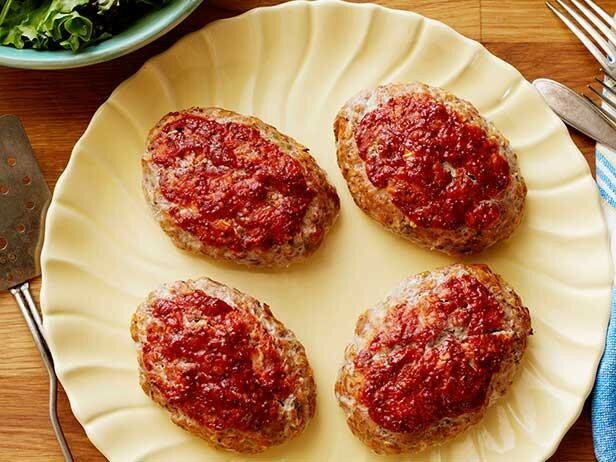 These meatloaves are very healthy compared to ordinary meatloaf. It is made with lean meats and low sodium ingredients. One serving has just 214 calories! It also has 1 gram of fiber, 5 grams of sugar and 6 grams of fat. The fat is very low compared to normal meatloaf, which has 17g. It is high in protein too- 27 grams!